Jordan's militant Salafist movement is once again making waves and the government may be reaping the benefits of their actions. The ultra-conservative group has staged rare street protests in recent weeks that are unrelated to the four months of pro-reform demonstrations inspired by the uprisings in Tunisia and Egypt. They have been pressing for the release of about 300 relatives jailed on terrorism charges. Among those detained is Abu Mohammed al-Maqdisi, the spiritual mentor of slain al-Qaeda in Iraq leader, Abu Musab al-Zarqawi. Mr Maqdisi being tried in a military court on charges of recruiting people to join al-Qaeda and other terrorist groups. Analysts refer to the militants in Jordan as Salafist Jihadists because of their extremist views. The group wants Islamic Sharia law to be implemented in Jordan. They ultimately want to set up an Islamic state. Some members have been convicted of trying to recruit people to fight against US-led troops in Iraq and Afghanistan, plotting attacks against US and Israeli embassies in Amman, or planning to kill foreign tourists. Earlier this week, authorities arrested prominent Jordanian Salafist Jihadist leader, Ayman al-Balawi, the brother of the al-Qaeda operative who blew himself up in a CIA outpost in Afghanistan in 2009. The suicide bombing by physician Humam al-Balawi was one of the worst attacks on the US spy agency. Eight people - seven CIA agents and one Jordanian officer - died in the attack. Last Friday, Jordan's counter-terrorism forces detained Ayman al-Balawi in a round-up of more than 100 members of the sect following a clash with government loyalists in Zarqa, the hometown of the al-Qaeda leader, al-Zarqawi. When policemen tried to break up the clash, the Salafist Jihadists stabbed unarmed policemen with swords, clubs and knives, wounding more than 80 officers. The bloody assault in the north of the country has stoked public outrage against the militants. Police said Mr Balawi was arrested for his fiery internet postings which have sparked calls for the overthrow of Jordan's ruler, King Abdullah, a moderate US ally. Pro-democracy activists have not demanded the king step down in any of their protests, but they do want to see some of his absolute powers curbed. Meanwhile, Hamas officials also implicated a Jordanian Salafist, Abdel Rahman Mohammad Breizat, in the murder of Italian aid worker Vittorio Arrigoni in Gaza. Breizat and another militant suspected in the murder later died in a Hamas raid. Mohammad Abu Rumman, an expert on radical Islamist movements in Jordan, said the authorities may have set up the Salafists in order to further crackdown on them. "With their protests, they already had a high profile before the clashes. They conjured up an image of threatening the peace," Mr Abu Rumman said. "Authorities played this card and expanded upon it. The message was: the street protests for reform are also bringing 'these' people out." However, Mr Abu Rumman was quick to point out that the militants are marginalised vis-a-vis the majority of Jordan's 6 million people and are relatively small in number. 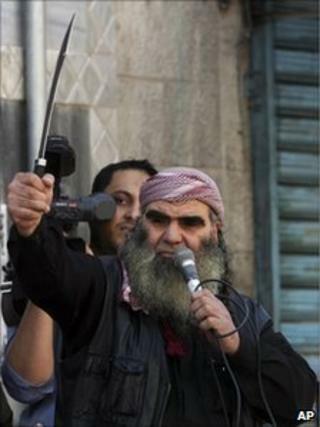 He estimates there are at most 1,300 Salafists in the country as opposed to state intelligence figures of 4,000. "We will deal severely with any sedition and behaviour which is strange to our habits and conventions," said Jordanian Prime Minister Marouf Bakhit during a recent hospital visit to policemen receiving medical treatment after the Friday clash. But political analyst Labib Kamhawi lays the blame squarely on the government. "The emergence of such extremist groups such as the Salafists in Jordan is always a reflection of the anger and disappointment by the people at large with some choosing to express this by joining such groups," he said. "I always hold the government responsible for the emergence of such groups because of its policies of repression, discrimination, corruption that make people really angry," Mr Kamhawi said. He said the Salafist Jihadists wanted to "ride the wave" of greater public freedom to demonstrate, but in the end the government's tolerance for such groups was less than that for the country's largest opposition, the Muslim Brotherhood or its political arm, the Islamic Action Front. Mr Kamhawi said the Jordanian government must do more to meet popular demands for reform. "If it chooses not to realise these, the government itself will be inviting violence and more extremism in the demands of the people," he warned.